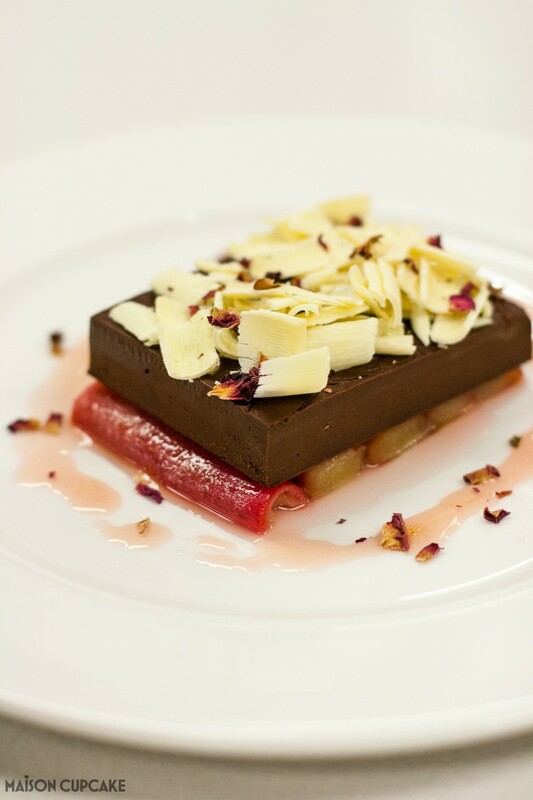 Just a few weeks after my previous visit to Le Cordon Bleu London, it was back again to make this easy chocolate ganache dessert with rhubarb by renowned pastry chef and chocolatier Paul A Young*. 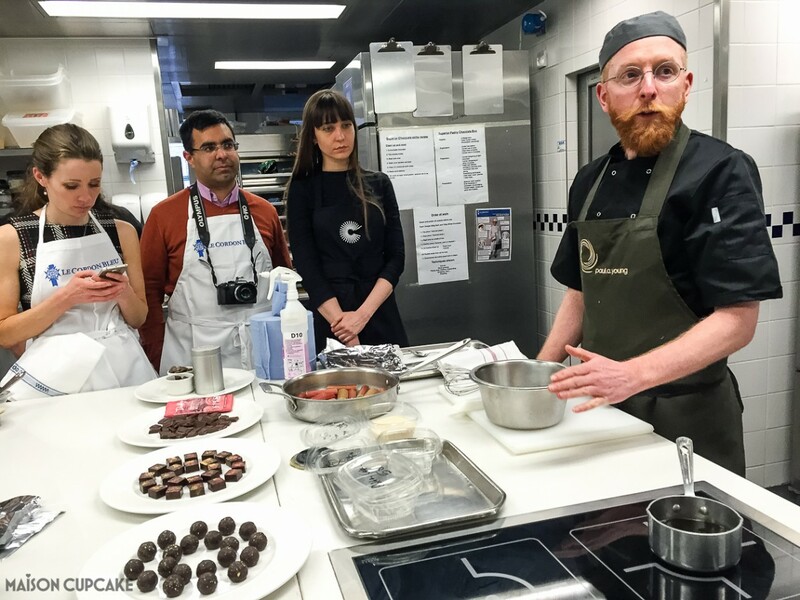 The evening, hosted by Great British Chefs featured a recipe demonstration and chocolate tasting with Paul and a second recipe (florentines) demonstration by Le Cordon Bleu’s head patisserie chef Julie Walsh. Despite the imposing kitchens of Le Cordon Bleu cookery school, we were assured these were both easy recipes we could replicate at home. You will find a full printable recipe further down this post. Paul’s dessert comprised a water ganache – which essentially means a ganache made from water based liquid rather than dairy left to set and served on top of a bed of roasted rhubarb then drizzled with syrup and scattered with white chocolate and dried rose. 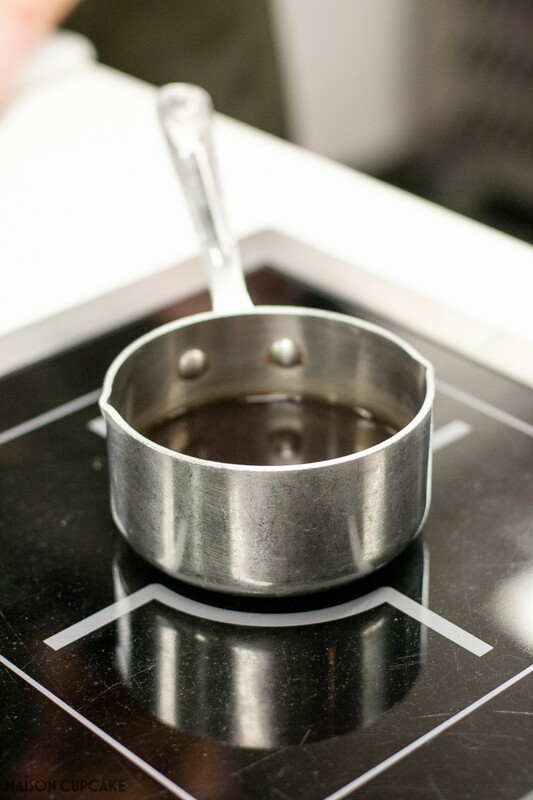 After heating our liquid to a fast simmer – Earl Grey tea here – we poured it over Valrhona chocolate and whisked like mad. I am a lazy whisker. I have been spoilt by electronic mixers. Raymond Blanc has previously told me to “put some effort into it mamie” and possibly Paul thought my efforts were a bit rubbish too. 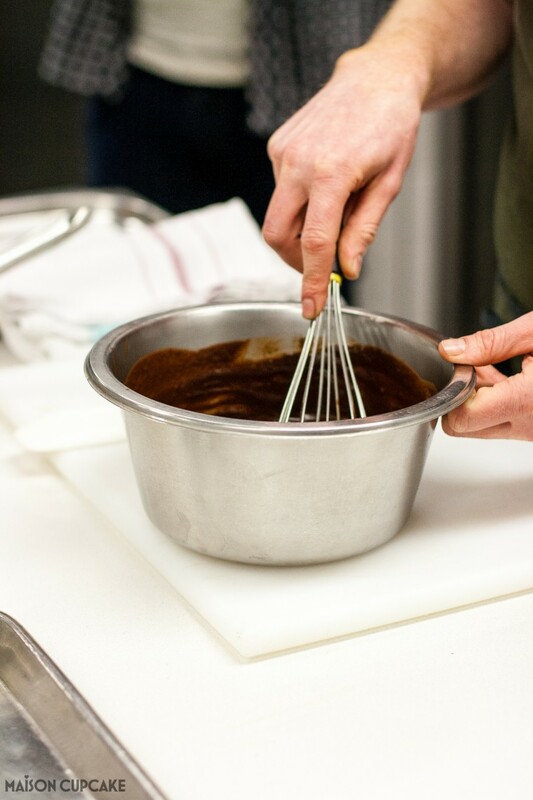 The ganache minus lumps of Valrhona chocolate was then poured into a lined tin to be chilled. Normally this would take 2 hours or more in a domestic fridge. The chocolate ganache dessert sits on a bed of rhubarb roasted in vodka. Paul recommended roasting more rhubarb than you needed to select the best looking pieces. Whilst our rhubarb roasted and chocolate ganaches were cooling in the blast chiller (I so want a blast chiller having been watching Bake Off Creme de la Creme lately), Paul gave us a recap of his career through a tasting of his most successful chocolates of the past thirteen years. 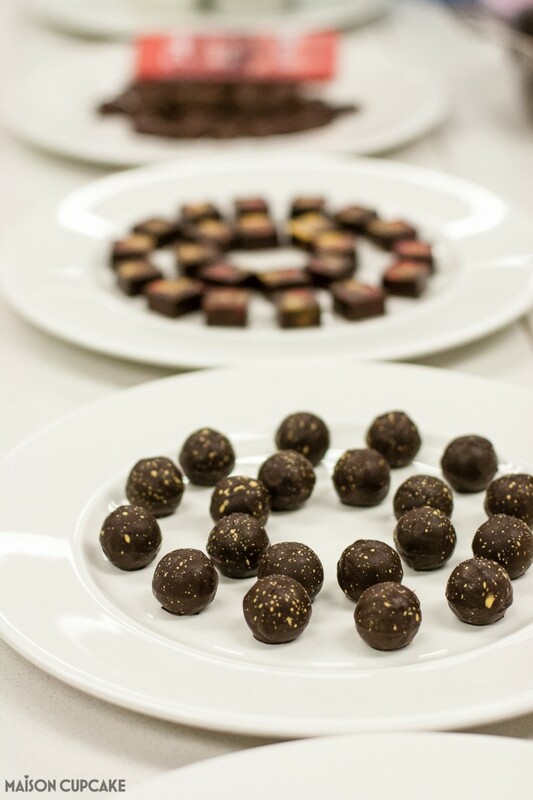 His salt caramel truffles have consistently been his best seller and his business makes over 2000 of them every week. 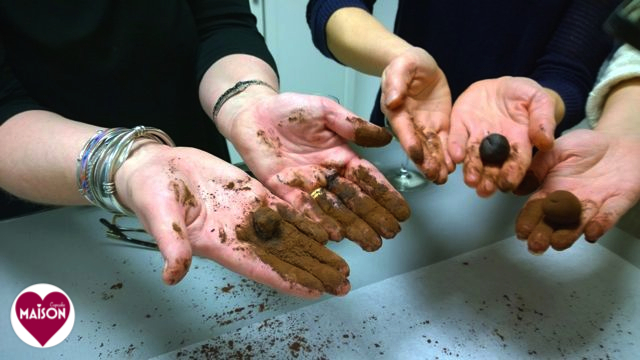 Previously a pastry chef for Marco Pierre White, Paul’s gift for chocolate making was spotted by Rococo Chocolate’s Chantal Coady and she encouraged him to specialise. He saw a gap in the market for very fresh chocolates and now has four London shops of his own. Paul A Young’s chocolates have best before dates on them of just weeks and he says they’re at their best within 7 days. (I have no problem eating chocolate in a hurry so this is advice I’m willing to heed). Paul will bide his time before using a new variety of chocolate in his products. If he’s intending to use a new chocolate he will taste squares of it daily over a period of weeks to and really “get to know it”. He joked you’d not likely fall in love on a first date and the same was true of a chocolate. Well – even if you think you’ve fallen in love, you need to get to know it better to make sure. We were all incredibly impressed how easy this recipe was to prepare. It would be very convenient to make in advance. It’s wonderful example of how some good ingredients simply prepared can be presented to great effect. …And finally decorated with generous shavings of white Valrhona chocolate! This easy chocolate ganache dessert is definitely one for your dessert recipe repertoire. Easy chocolate ganache dessert with roasted rhubarb in vodka topped with white chocolate shavings and rose. Note that the 3 hour prep time is mostly chilling. Hands on time is under an hour. For the ganache, bring the Earl Grey tea and sugar to the simmer, pour onto the chocolate and whisk well until smooth and glossy. 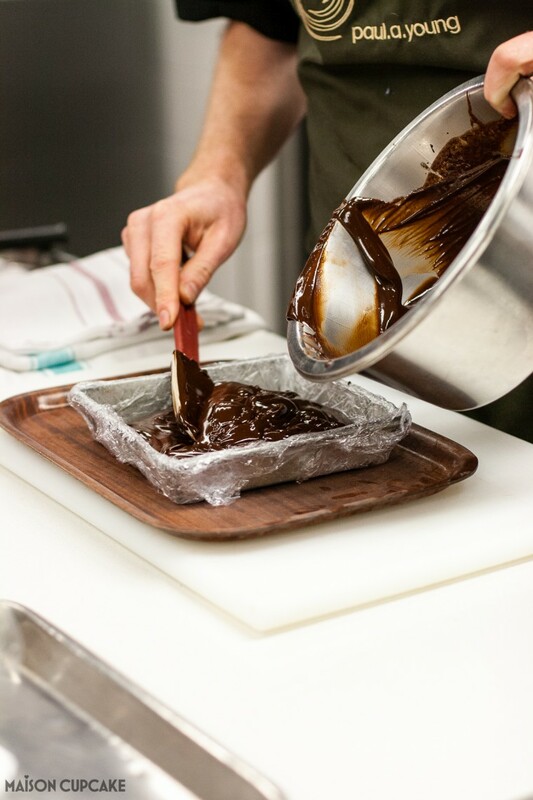 Pour the ganache into a 6 inch (15cm) square baking tray lined with a double layer of cling film. Refrigerate until fully set. Approx 2 hours. For the rhubarb, place the perfectly cut rhubarb onto a baking dish, sprinkle with the sugar and vodka. Cover with foil and braise for 20 minutes at 175°C. Take out of the oven and allow to cool while still covered. Once cold, carefully lift out the rhubarb onto 4 layers of kitchen towel to dry out slightly. Pour the cooking liquor into a saucepan and reduce slightly to a light vibrant pink syrup. Cut the white chocolate bar with a large knife to create very thin shards and set aside. Place 7 to 8 pieces of rhubarb on to a flat white round plate. Take the ganache from the fridge and carefully turn out onto parchment paper. Remove the cling film and cut the ganache with a hot knife to the same size as the rhubarb rectangle. 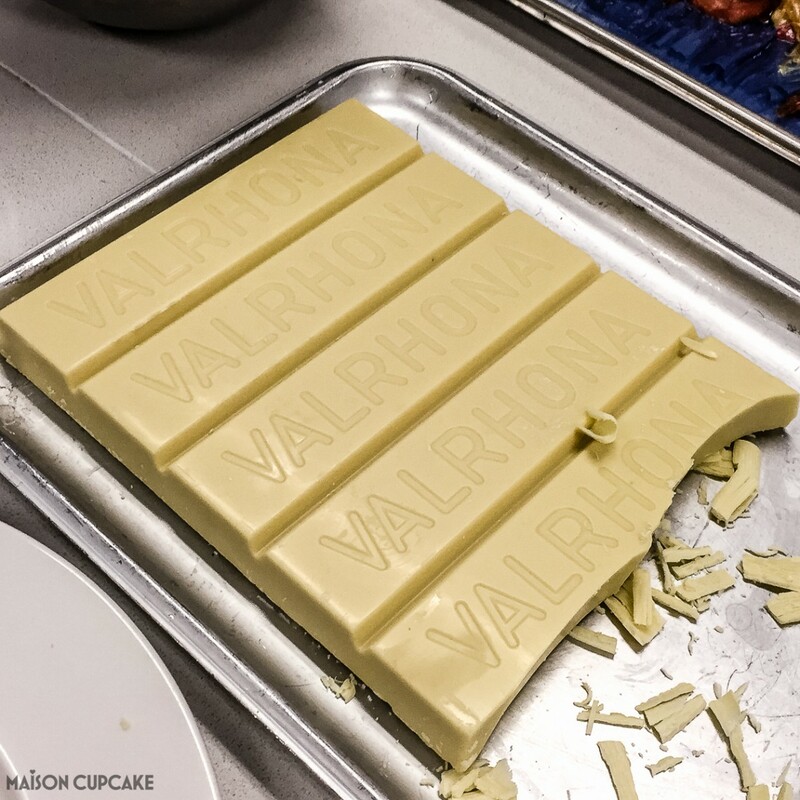 Cover the top of the ganache rectangle with white chocolate shards. Place the ganache rectangle gently onto the rhubarb with a palette knife. Now place rose petals onto the white chocolate decoration. 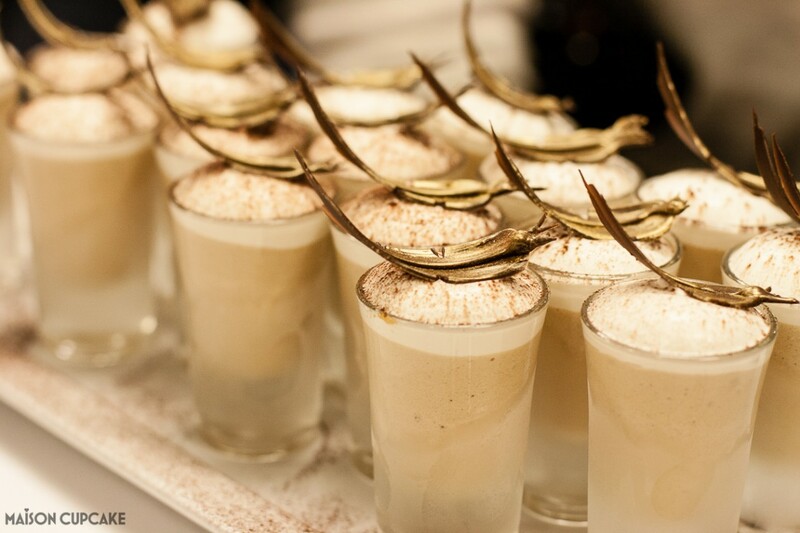 Spoon the vibrant pink liquor around the dessert and finish with small pieces of gold leaf between the rose petals. 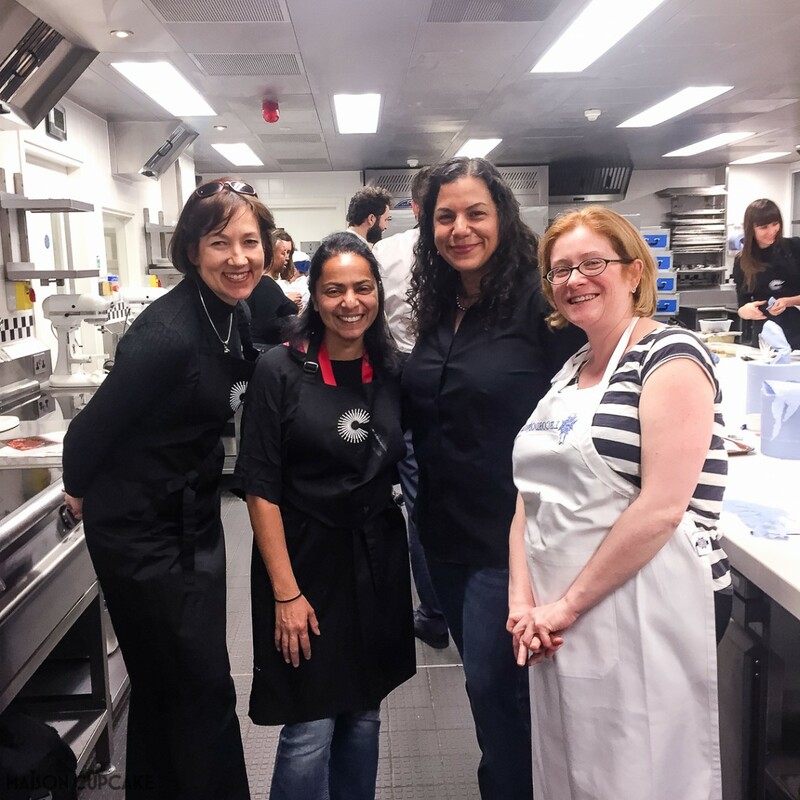 Finally – that’s me on the right posing with a few friends – Jeanne Cooksister, Urvashi of Botanical Kitchen and Judith of Mostly About Chocolate. 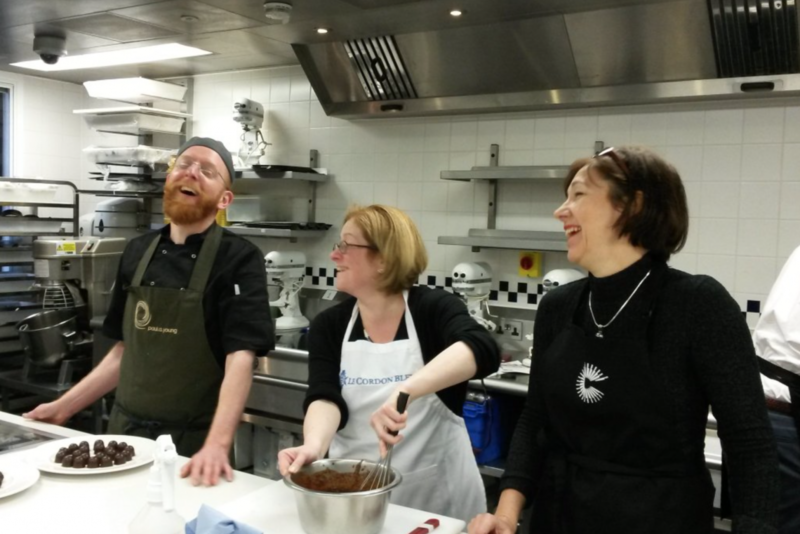 With thanks to Great British Chefs who invited me to this Paul A Young chocolate class at Le Cordon Bleu London. Paul A Young has branches in Islington, Soho, Heal’s Tottenham Court Road and Threadneedle Street – and tantalisingly he says there will be more shops to follow. In the meantime why not visit Great British Chefs for more stunning chocolate recipes. 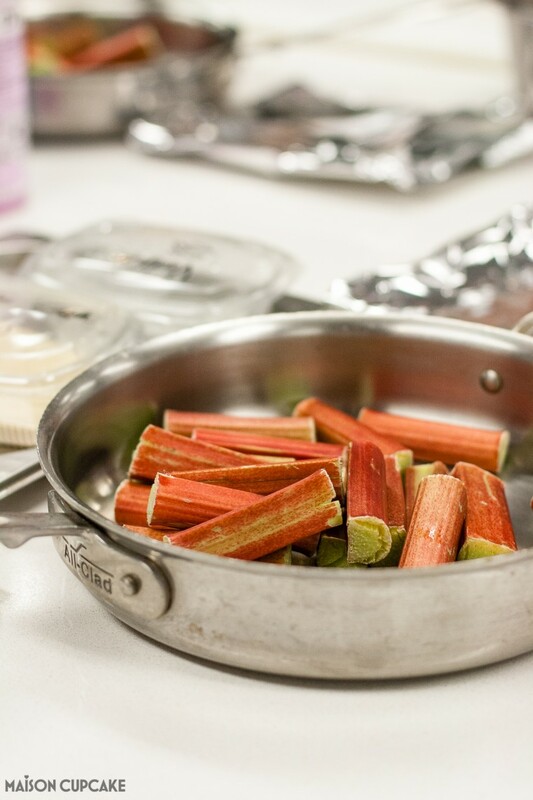 and this previous truffle making class with Paul A Young post and my other rhubarb recipes.